Galvanic separator uses for distinguishing different network layers from each other. The separator prevents potential differences and thereby dangerous currents. TRIS-1002/AEN separates both the inner conductor and shield apart. Multi-switch, te gebruiken om twee satellieten te ontvangen. Uitgerust met 12 uitgangen voor gebruik in combinatie met twee quad-LNB's, maximaal 12 tuners met signaal. Triax TMS 13xx SE P-EU series is a stand alone SAT-IF multi switch series for 3 SAT positions (12 SAT polarities + terrestrial) in versions with 8 to 32 subscriber outputs and passiv TER. With built-in PSU and EU Mains plug. Triax TMS 13xx SE A-EU series is a stand alone SAT-IF multi switch series for 3 SAT positions (12 SAT polarities + terrestrial) in versions with 8 to 32 subscriber outputs and active TER. With built-in PSU and EU Mains plug. 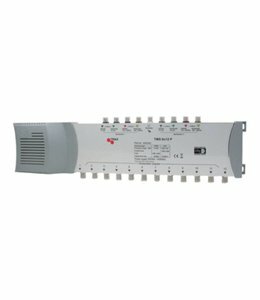 Triax TMS 17xx SE P-EU series is a stand alone SAT-IF multi switch series for 4 SAT positions (16 SAT polarities + terrestrial) in versions with 8 to 32 subscriber outputs and passive TER. With built-in PSU and EU Mains plug.